Ensure the safety of your employees and comply with OH&S regulations by remote monitoring for Humidity and Heat Stress to protect workers from extreme working conditions. 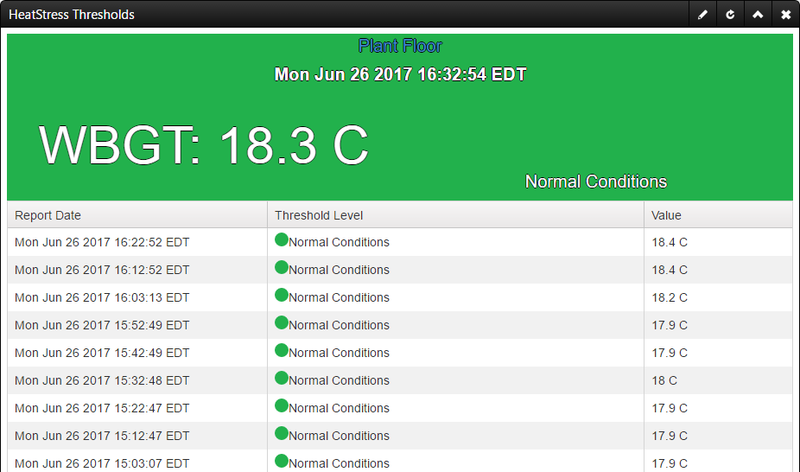 Monitor for WBGT, Humidity, Humidex, and Temperature with SCADACore’s Heat Stress Monitoring. Heat stress monitoring is a requirement for most health agencies. Warehouses, factories, outdoor labour, shipping yards, or anywhere where heat and humidity could potentially be a health concern or could affect product quality, should be monitored. Set escalating alarms with early warnings can go to foremen, while higher thresholds will send email or SMS alerts to the users. Heat stress units can be embedded inside the SCADACore Communication Package for a mobile solution. Heat stress units are also compatible with the Sentinel Local Alarm Box. Add sound level and particulate monitoring for a complete monitoring package. You have an existing heat stress meter that you want online? SCADACore will integrate your product at no charge. Labourers and tradespeople such as Road Crews, farmers, framers, welders, pipe fitters, landscapers, and construction crews are a susceptible to heat stroke and heat related injuries. A portable remote monitoring unit can be set up and send text messages reminding employees to take caution whenever a threshold is reached. A simple message such as “Take 5 minute break and drink liquids” could help prevent serious injury. Indoor warehouses are difficult to cool in hot summer months. Permanent monitoring stations can be set up with local displays or callouts to allow employees to monitor their own heat-stress safety levels. SMS and Email messages to supervisors or foremen add an additonal level of alarming to help keep your employee’s safe. Due to the enclosed nature of mining heat exhaustion can be a concern. Wired monitoring allows communications to reach SCADACore and signal supervisors above ground, while SCADACore Alarm Stations can notify workers under ground. Welders and fabricators deal with high heat all day long and are sometimes unaware of the dangers of ambient consistent heat and humidity. The SCADACore alarm stations can notify the workers and supervisors when it is time to drink more water and take a break from work. Humidity in shipyards is always a concern during the hot summer months. 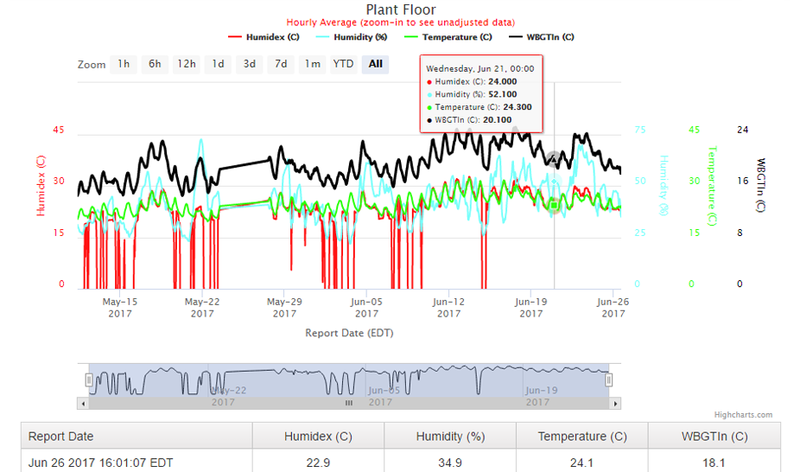 Although temperatures can sometimes remain relatively low the humidity drives the heat-index and WBGT up causing concern for the workers. SCADACore alarm stations can ensure there are adequate warnings in place to keep your employees safe. Long-term construction projects can require an immense safety presence on-site. Heat exhaustion is often overlook as it is not an immediate danger to most employees. SCADACore Alarm Stations and remote callouts can keep your employees safe while you are focusing on more pressing dangers. 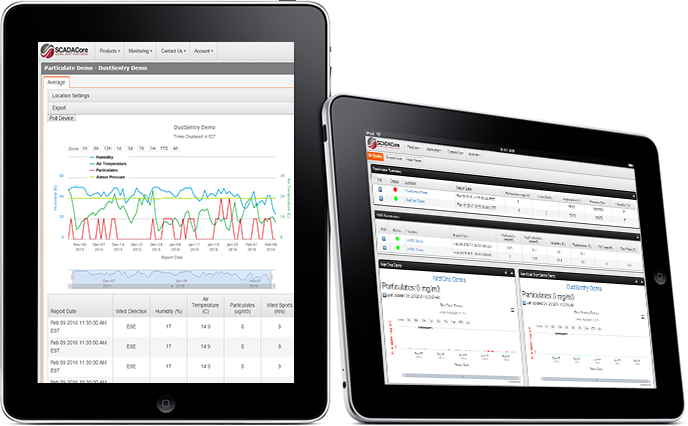 Online heat-stress monitoring takes the manual work out of the monitoring process. There are no thermometers or hygrometers to manual check and notify staff. Using the intelligent Email / SMS / Voice callout system, alerts can be sent to dozens of individuals at once, notifying them of precautions that need to be taken. Current conditions are color-coded and historical data are displayed for simple, convenient access. Escalating callouts allow administrators to set Email, Text, or Voice alerts for specific groups of people at specific heat levels. This allows foremen and supervisors to be alerted before employees when levels are elevated but not necessarily dangerous. Further escalation in temperature levels can alert employees or contractors on-site. Charts allow foremen, supervisors, and industrial hygienists to identify times of the day when heat stress can be dangerous to the employees. SCADACore communicates with products such as the 3M QuesTemp 44 and report a wide-range of temperature and humidity readings such as: Humidex, Heat Index, Dry Temperature, Wet Bulb Temperature, WBGT Indoors, and WBGT Outdoors. 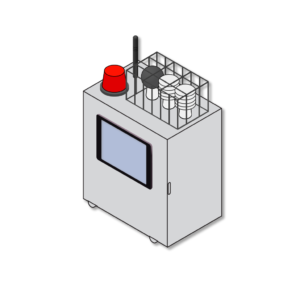 QuesTemps are also compatible with SCADACore Alarm Stations. 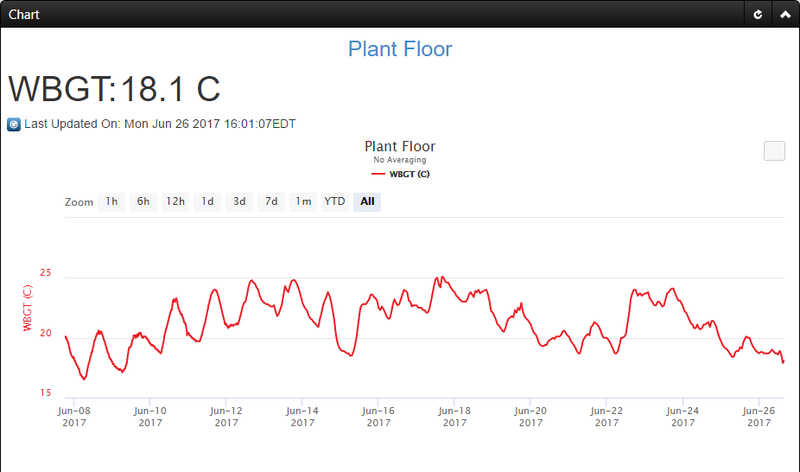 SCADACore provides heat stress monitoring package, complete with onsite adjustable escalating alarms and siren), onsite data logging, and built-in connection to SCADACore with all IIoT Live capabilities. This system provides temperature, humidity, heat-index, WBGT, and more, along with powerful alarming features, for the less than the cost of industry-leading data-logging heat monitoring systems. Do you want more information on SCADACore’s Industrial Hygiene solutions? Are you concerned about your employees safety and heat exhaustion? Are you required to record and identify dangerous temperature, humidex, and WBGT levels for your employees? 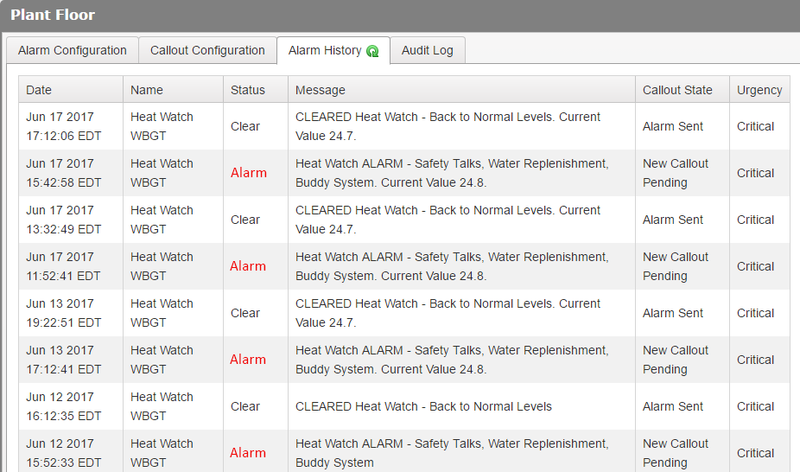 Do you want to automate the alert system rather than trust your employees with know the signs and symptoms of heat exhaustion? Are you an Industrial Hygienist who wants to provide remote heat stress monitoring as a service, brand your SCADACore site to your colors, and logo and save money on permanent monitoring?